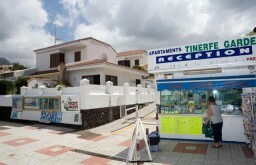 The Tinerfe Garden’s are just 300 metres from the resort centre of the Costa Adeje, which means you’re really close to all the lovely bars and cafes that the resort has to offer, and you’re really near to all the great shops that are there! You’re also within easy access of the beautiful beach, so fun in the sun is close at hand in the crystal blue waters. When you arrive at your lovely private apartment you have a beautiful ensuite bathroom, satellite TV and private sun terrace for relaxation. The Hotel itself has a great outdoor swimming pool and you’ll find a wide range of drinks and snacks in the quaint little hotel bar, and once you’ve decided what you want you can drink it in style on the lovely sun terrace that allows you to spend an entire day soaking up the sun in the beautiful hotel surroundings. A great little hotel for those who want some basic accommodation as they explore the wider area during the day- however, the pool is lovely!